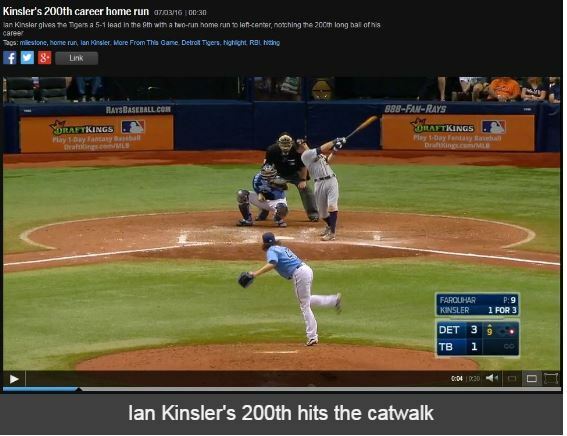 Detroit 2B Ian Kinsler crushed his 200th career home run today in a 5-1 win over the Rays. The two-run shot, his second in two days, came off P Danny Farquhar in the 9th inning and struck the catwalk high above Tampa Bay’s Tropicana Field. Kinsler is the fifth Jewish player to reach the 200-homer threshold. He joins Hank Greenberg (331 HRs), Shawn Green (328), Ryan Braun (268), and Sid Gordon (202). Kinsler passed Al Rosen (192) earlier this season. Kinsler’s 200th came in his 1,460th MLB game. By comparison, Greenberg reached 200 HRs in his 860th game, Braun in his 867th, Green in his 1,084th, and Gordon in his 1,458th. All four other players hit multiple homers on the day they reached 200: Green hit a record-tying four round-trippers (May 23, 2002), Greenberg hit two (September 7, 1939), Braun hit two (September 16, 2012) and Gordon hit two (August 14, 1955) — one each in both games of a double-header. It’s not the only milestone Kinsler reached today. According to MLB.com, he now is one of only three active players — and 40 total in MLB history — with 200 home runs, 1,000 runs scored, 1,600 hits and 200 stolen bases. The other active players are Alex Rodriguez and Carlos Beltran. Kinsler is enjoying an unexpected power surge this season. Since peaking at 32 home runs in 2011, the 34-year-old Arizona native has yet to hit 20 again. With 16 so far in 2016, however, he already has exceeded his season totals from 2013 (13 HRs) and 2015 (11) and is on pace to breach 30. The 11th-year player also shone in the field, making a slick backhanded stop and toss to retire Curt Casali in the 3rd inning. Get your Jewish baseball news via e-mail — free!